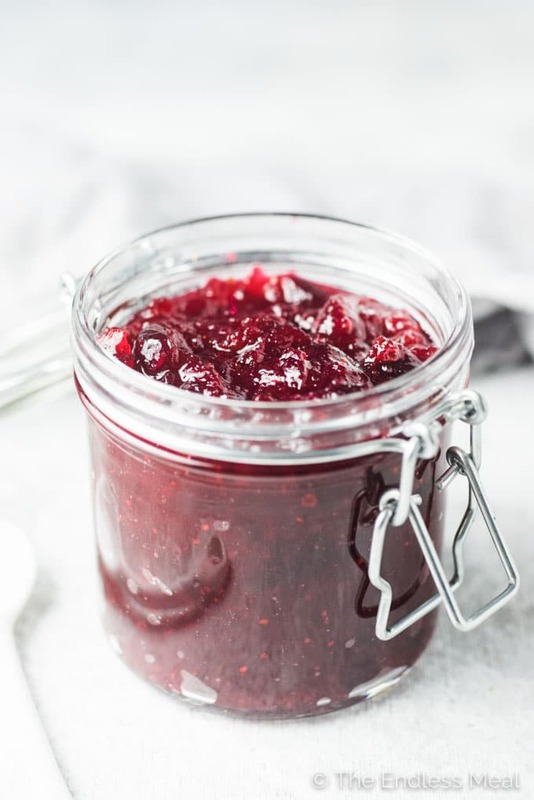 This delicious Ginger Orange Cranberry Sauce is the turkey dinner side dish I've been making for years. Every Thanksgiving, Christmas, and Easter dinner I make a batch and it's always met with rave reviews. 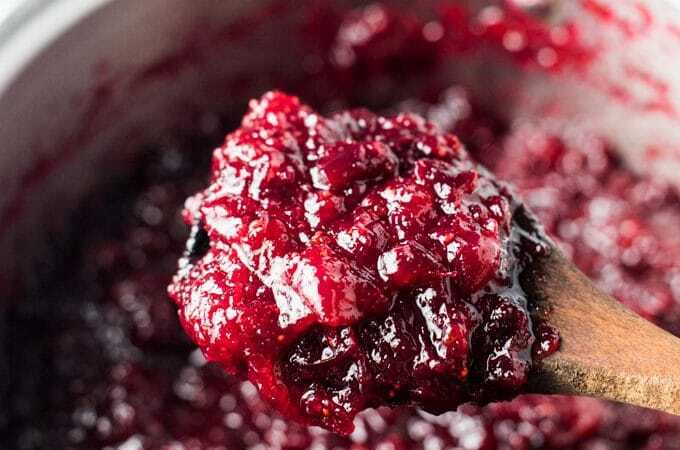 The subtle orange flavor and gingery kick make this the best cranberry sauce recipe around! 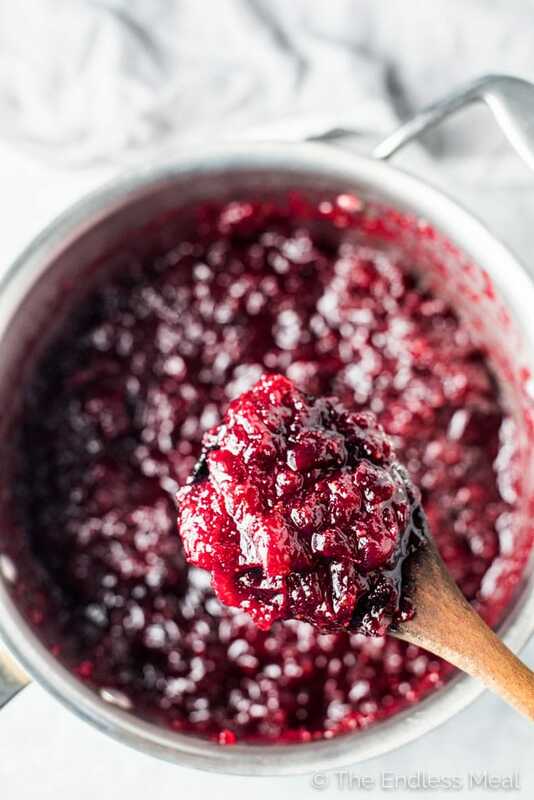 This delicious Ginger Orange Cranberry Sauce is the 26th Throw Back Thursday post. It's the once a month series here when I find old blog recipes to remake, rephotograph (they need it!) and reshare them with you. Last October, #tbt was a recipe for Coconut Acorn Squash Curry. ← So freaking good! The year before that, it was these Cheesy Leftover Mashed Potato Cakes. ← Also so good! With Canadian Thanksgiving coming up this weekend, I thought it would be the perfect time to share this recipe with you again. I've been making this Ginger Orange Cranberry Sauce for so many years that I don't even know where the original recipe came from. I remember that the original was too sweet for my taste, so I reduced the sugar. I'm also pretty sure I upped the ginger by quite a bit. This recipe (honesty here!) doesn't get many people looking at it, and it's really a shame. It's the best cranberry sauce I've had, and I want you guys to be able to enjoy it, too. It's got that perfect combination of tart and sweet, a beautiful gingery kick, and a subtle orange flavor in the background. Whether you're celebrating Thanksgiving (or Friendsgiving!) this weekend or coming up in November, can you promise me you'll make this? I remember when I first started to realize that I could make the things that I had always thought only came in tin cans, or plastic bottles or tetra packs. It felt like a revelation. Prior to this, I never gave any thought as to where these ‘food' substances came from. I would simply walk to the store, buy a can, go home, open it with my can opener and … shloop, out it came. I grew up thinking that the cranberry sauce on the family dining table to the left of the bird had to be a short, thick, jello-like log. I thought it had to be ribbed. Turns out I was (thankfully) wrong. I was never a big fan of cranberry sauce. In fact, the first time I made it it was only because I knew other people would want it. And, don't tell anyone, but I might have wanted to try and impress them, too. While I can't speak on behalf of anyone else at that dinner party, I can say that there was at least one person I impressed. That's right, me. Does that make me sound like I'm bragging? I hope not because it's certainly not my intention to come across that way. It's just that this orange cranberry sauce was really really good! This is no jello-like ribbed log. This is as rich and hearty as Scottish porridge. The duet between sweet and tart is balanced out by a spicy kick from a ton of grated ginger. And then somewhere in the background a little citrus pops by to say hello. 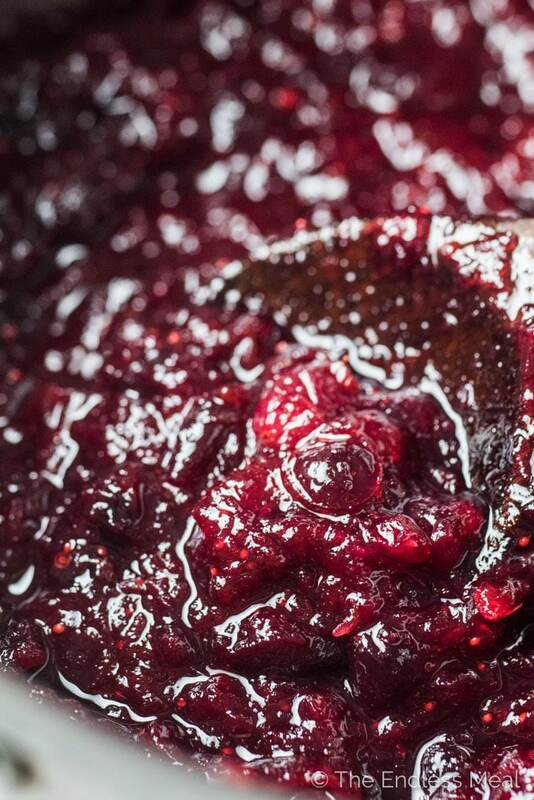 This cranberry sauce deserves a good chunk of your Thanksgiving dinner plate real estate. And did I mention that it is super easy to make? Save the leftovers, if you're lucky enough to have any, to smother on turkey sandwiches, dollop on a chicken breast, coat a piece of salmon with or serve on a cheese plate. This year I doubled the recipe in hopes that I'll be able to enjoy it for more than one evening. This orange ginger cranberry sauce makes the perfect side to your Thanksgiving or Christmas turkey dinner. It's easy to make, and everyone will LOVE it! Add all the ingredients to a medium-sized pot over high heat. Bring the pot to a boil then reduce the heat to medium. When the cranberries begin to break down, use the back of a wooden spoon to crush them. Simmering the cranberry sauce for 10 more minutes, or until it is slightly reduced. Note: the cranberry sauce will thicken as it cools. Remove the pot from the heat and allow the cranberry sauce to cool before transferring it to a jar. Can easily be canned to enjoy later in the year. Work great with my turkey!!!! Super yummy!!! I’m so happy to hear you like it!!! Lovely recipe – has anyone tried it with dried cranberries? I haven’t tried it with dried cranberries but I suspect that it wouldn’t work well. Fresh cranberries have a lot of liquid in them which helps make the sauce. This is the best cranberry sauce ever! I made it to go with some BBQ chicken (sounds weird but it’s so good) and loved it. So easy to make too! I made this for thanksgiving dinner and it was incredible. Everyone loved it. Thank you for the great recipe! I made this for Thanksgiving, and everyone loved it… and I must say it is even better after a few days. The ginger seems to have lost some of its sharpness and has mellowed a little. I made turkey pies with the leftovers and they are great with a dollop of this jam / relish. Thanks for the recipe! I’m so happy you and your family liked the recipe! Happy Thanksgiving! trying to cut down/substitute for the sugar. I must say, the orange and ginger sounds good, and I will try it. The recipe I was referring to was not the one on the bag. I should look more closely on the bag since I’ve never seen one there lol! Definitely feel free to reduce the sugar and taste test until you get a sweetness that is just right for you. I hope you like it as much as we do! I have a few great recipes for Brussels sprouts. I know the American Thanksgiving is coming up soon so I will post a recipe for you. Thanks for the suggestion! Kristen ‘I love it’.. You difinately bring food for thought to the table. Thank you for sharing your blog with me, I look forward to following you. wow,you are such a talented young lady,everything you touch turns into gold and thats why I love you.I will certainly try some of those receipe’s when I get some time off.very well done…. Thanks, Sonja! I love you too!! add a shot of Grand Marnier at the beginning and reduce it a little longer…it’s totally worth it! That’s a great idea, Earl! I love the idea of adding ginger– I will be trying that for sure! Orange and ginger are so great with cranberry sauce. This homemade version sounds fantastic! I definitely agree they’re a great combination!